Agents of evil secretly prowl the cities and wilds of Loerem, preparing the way for an invasion that will threaten the lives and freedom of the four races. An elven messenger travels through unfriendly lands, determined that his warning will be delivered in time to save lives. Captured and imprisoned, the messenger fears that his mission has failed unless he can convince his fellow prisoners to help him escape. 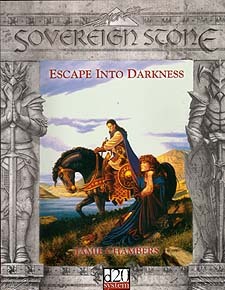 Escape Into Darkness is a d20 System adventure for four to six 2nd level characters and can be modified for use with beginning heroes or more seasoned adventurers. This adventure is tied to events in the Sovereign Stone novel Guardians of the Lost by Margaret Weis and Tracy Hickman, though the novel is not required to play.